I meanwhile recovered from all the activities of the last days. 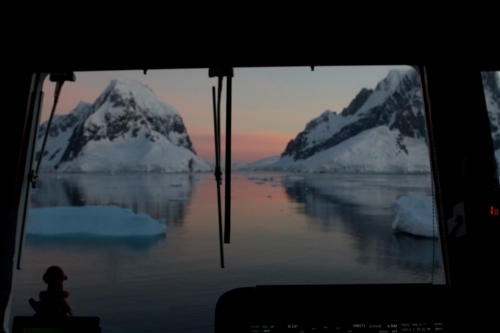 Plus now I am really excited about my upcoming adventure: staying at Port Lockroy… . Since sleep was not really going to happen I decided to join Magnus, our Additional Navigation Officer, on the bridge. He is on watch from midnight until 06:00 hrs every day. 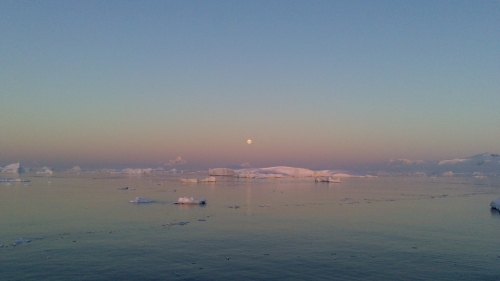 Just off Crystal Sound we observed an outstanding sunset – and at the same time the moon had risen just ahead of us. What an indescribably beautiful scenery!!! I did not know where to look – at the setting sun glistering in the water or at the rising moon tinting the land-scape in a pinkish colour. This was amazing – just out of this world… . It became pretty dark at some point and Magnus had to concentrate on navigating all of us safely through the ice. But we listened to good, partly classic and for a long time not heard music throughout the night – and there was always a good cup of coffee around. 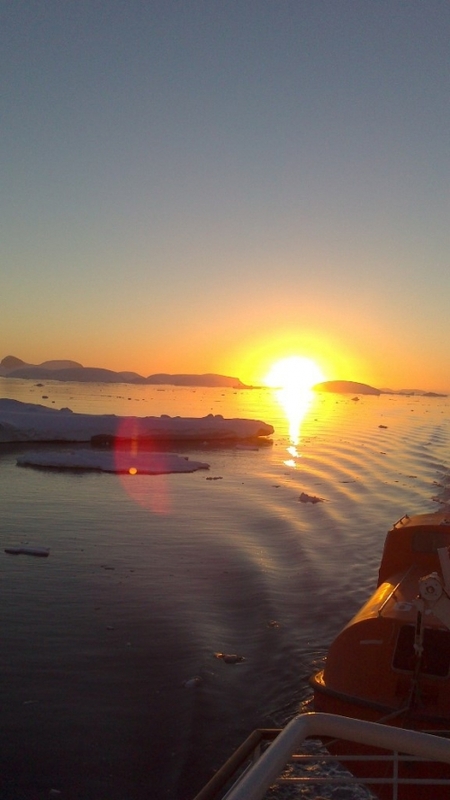 During the early morning hours we passed through the extremely scenic Lemaire Channel. The channel, which divides the Antarctic Peninsula from Booth Island was actually discovered by the German Expedition under Captain Eduard Dallmann in 1873 / 74. Only 25 years later, during the Belgian Expedition in 1898, it was named – by Adrien de Gerlache and after the Belgian Africa-Explorer Charles Lemaire.